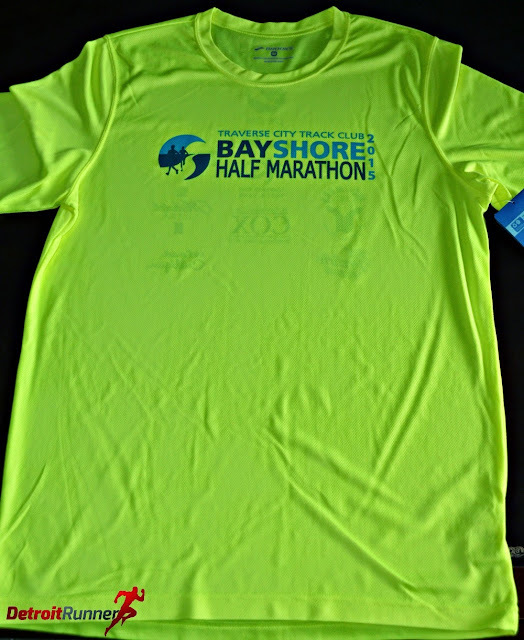 I ran my first full marathon here at Bayshore in 2011 and had a great time. I had always wanted to go back for just the half marathon and this was just as fun as the full was for me. There are a few more logistics since it's a point to point race but overall, a fantastic time. It's even better that this is on Memorial Day weekend and most make it a vacation given it's in beautiful Traverse City. This one sells out in about 20 minutes so if you are interested, you need to be ready in December to sign up. You won't be disappointed - it's one of the best views of a half I've been to. Registration was very simple. You got online in December and signed up when they opened up registration. For this one, you have to be ready to sign up the minute they open since it sells out so fast. I didn't have any issues and was able to get in no problem. Just don't delay. One thing they did do was have registration on a Monday during work hours which I didn't like but I made it work. 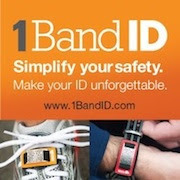 You also have the ability to sell your entry if you get hurt. I had planned to run the full last year and ended up selling my entry for full price given the demand at the race. Packet pickup was on the Friday evening before the race and also on race morning. Since I had an hour drive over to packet pickup, I didn't drive over Friday night to see the expo and get my packet. I did come early as packet pickup started at 5am. I was up at 3:15am!!! Holy cow that's an early start. Since the majority of people are from out of town, packet pickup was very simple and I was done in a matter of minutes. You first received your bib for the race. After that you got in line and received your tech shirt. I believe I got there around 5:30am and, as you can see, there was hardly anyone there getting their packets. After I put my packet in the car, I headed to the rest room. There was a huge line for the inside bathrooms so I made my way to the Port-o-Johns with no lines. After that, I got on a school bus to take me to the start of the race. Because it was a point to point and there were 2,700 runners, they had numerous busses going back and forth from the school where packet pickup was located. The race warned you not to wait until the last minute since not everyone could get on the last bus. Overall, it was an easy and well organized process. You can see below that we got dropped off in the middle of a field. It was pretty chilly out so I was surprised to see that the race didn't have sides to the tent on. This would have really helped to keep people warmer but it was not too bad(low 40's) and we made do with it. It did help that many of the runners were under the tent and close together to help keep us warm. There were also plenty of port-o-potties. I did end up getting in line about 20 minutes before the start and finished just about when the race was about to start. I could not have planned it better! After about an hour wait, we all got in line and were ready to race. It was a fairly uneventful start No National Anthem. No band - not even a gun shot to tell us to start. We just started following others when they started running. The course, ah, the course! What a spectacular course this is. It's one of the prettiest courses I've ever run and the main reason it sells out so fast. As you can see, it's primarily on the water so the views are incredible. I did somewhat have a plan and that plan was to get my sub 2 in order to keep my all road half marathon streak of 2 sub intact. I was able to do it just barely! Conditions were perfect for running starting in the low 40's and finishing in the mid 50's. We pretty much started the course with a couple larger hills. The first mile was really hilly and then it was just little rollers throughout the rest of the course. It was crowded but manageable and there was no need for a wave start. As you can see, the sun was out in full force and the views were going to be incredible. When I did the full, it rained for a portion of the race. It was nice to see the sun. The police were out in spots but the course was not a closed course. I will say though that unless you actually lived on the road, you would probably avoid the area all together since the residents know that the race is going on. It's a big deal in this small community. After mile one, it was all down hill so to speak. I didn't know what to expect for the first mile but it wasn't too bad. There were spots of shade along the course but overall, you were in the sun more than in the shade. We then hit our first spot on the waterfront. Check out those views! As I said, it's one of the most scenic races I've ever done. Before I knew it I was at mile 2 and we were cruising along. The course was well marked and the markers were well placed. As you can see, we were almost at mile 3 and the crowd had not thinned out too much but it was still pretty comfortable running even with the people shown below. Then we started seeing the marathoners(and the reason that runners started to run just on one side of the road). For me, that was a great way to take my mind off running. This is one of the best parts to an out and back course(for the marathon only) is to see people ahead of you(or behind). The front runners always seem so eloquent like they are on a stroll at the park. Another great thing about seeing the marathoners come by is that I was looking for a few people that I knew were running the marathon to say hello to as they ran by. It really took my mind off things as I was looking for them. In fact, it took my mind off running so much that once I had seen the people I knew, the running became harder. That also could have been because I was also running this race harder than I do for training on long runs and I've not been on the roads much in training. After about mile 7 is when things got harder for me. Not because of the distance but just because I had not been used to running at those speeds. I really needed to concentrate for the last 6 miles in order to maintain my pace. I always love seeing runners running with the American flag. It's hard enough to run a marathon much less carrying a flag with you the entire time. As you can see above, some of the residents had fun offering beer and water along the course too. There were numerous residents out cheering runners and it was great to see them welcome the runners. The other thing was the spectators. While it's no Chicago marathon crowd, there are spectators in spots to help keep you moving. Keep in mind that I've been used to trail running where you might see a few spectators at the aid stations. Soon we were near the 10k turnaround and it was nice to know we didn't have much more to run. Most of us at this pace were running pretty strong still by this point and were looking good overall. The key word here being "looking". Below was the last water shot I took as we headed back to the school. We took a run through the local college there and then back onto the high school campus. We were now back at the start of the marathon race and heading to the track to finish up there. I love a track finish and there were lots of spectators in the stands cheering on runners. As you were crossing the finish line, the announcer was calling out finishers names. I really love that aspect of a race. It makes the finish feel special when you hear your name. The aid stations were plentiful and fully stocked. The volunteers were giving out water, Gatorade, GU gel and GU chews. The aid stations here are pretty large compared to most races as well so they take tons of volunteers to help. The aid stations were very organized and the volunteers were standing in the middle handing people water cups as they ran by. The finish area was huge and very organized. You started with receiving your race medal. After your medal, you took a short walk and there were volunteers giving you waters. No spectators were allowed in this section. After this section, you made your way to where the food was and you could meet your family there. The race had Moomers ice cream at the finish and it's awesome ice cream! They also had chocolate milk, water, and plenty of food. 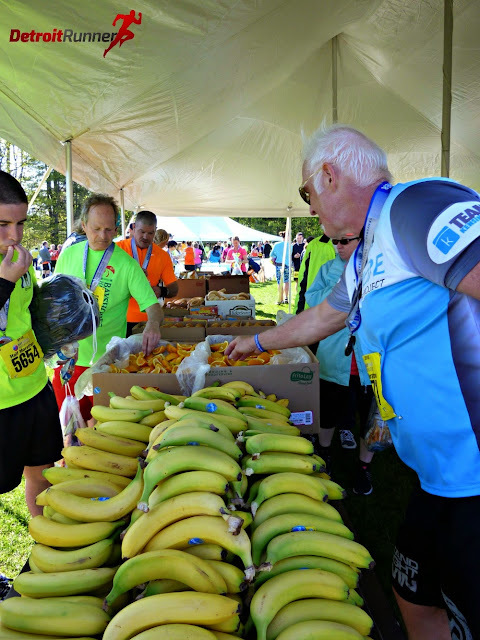 The race offered bananas, oranges, cookies, chips, pretzels and bagels. The volunteers did a great job putting everything together and you were able to get into the line and out very quickly. Below you can see the crowd in the stands as you finished. Because it was a nice day and there was plenty of room to spread out, lots of the runners stuck around to socialize. For your $80 race entry(highest I've paid for a half) plus online fees(half), you received a certified course that was semi-closed to traffic. 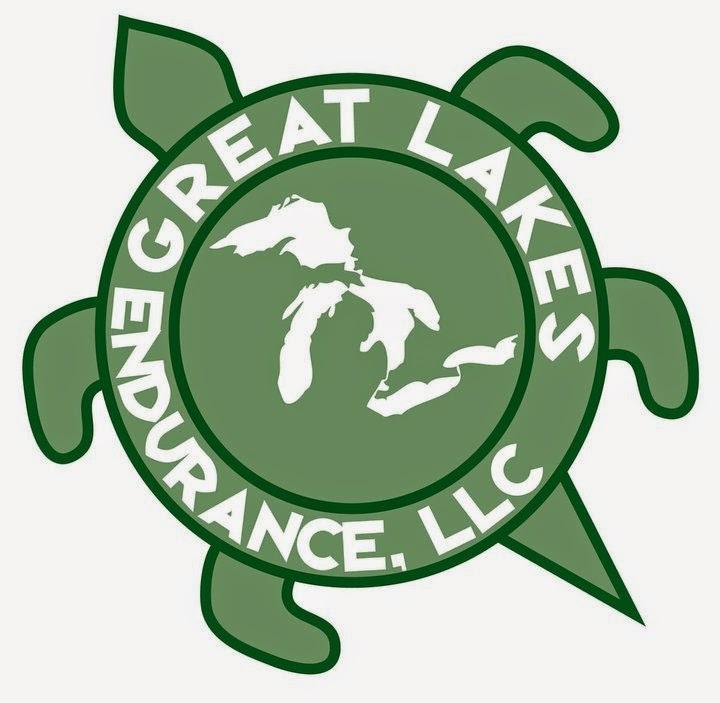 You also received great aid stations along the course. You received a custom race bib. I was surprised they didn't offer QR codes on the bibs so you could scan your results right away. I didn't even look for my final results until I got home from the weekend but they were up when I looked for them. You received a short sleeve, Brooks tech shirt! 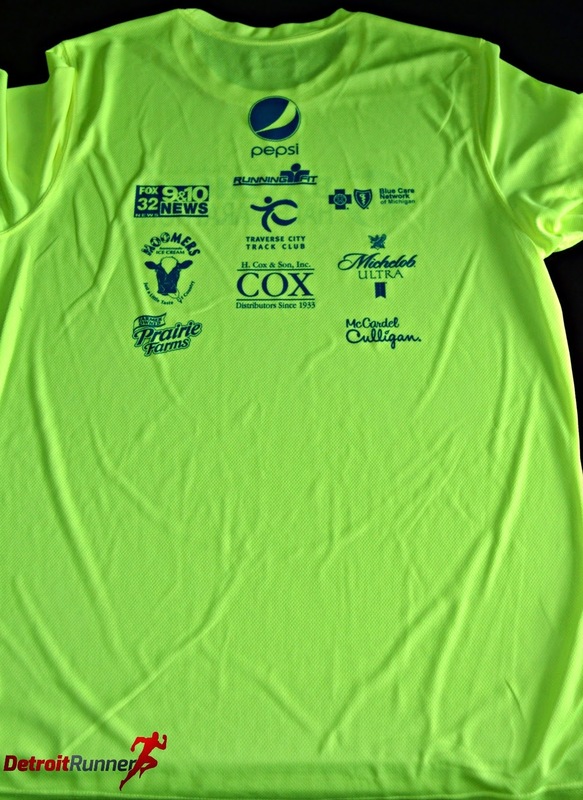 Yea how I love the Brooks tech shirts and this one will get used regularly on training runs. It's a really bright color this year but it's made well, fits greats and is also a very nice design. The logo is large but not overpowering. You also received a finishers medal. The half medal is not as large as the full medal but it's a similar design and very nicely done. Organization was top notch for this great event. They certainly know what they are doing. All aspects of the race were excellent. The point to point adds an element of difficulty for the race and they pulled it off with great success. I was very pleased with everything they did to keep things very organized. 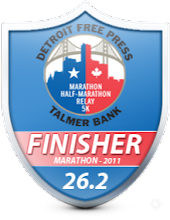 Overall, this is a must do half marathon if you live in Michigan(even if you don't). It's a fantastic course and well run. The race has some extremely competitive runners race here every year. The communication via email is great. The start and finish line areas were well planned out. The race medal is nicely done and the shirt is awesome as I love Brooks shirts. If you have not done a race here, you need to do one by signing up in December and making a vacation out of it. Just be sure to sign up the first 1/2 hour of registration(at least for the half) and make sure to reserve your hotel right away(if not sooner) as well. You'll be happy you raced this one. I'll certainly be back in future years. Disclosure: I paid for this race entry with my own funds. All opinions are my own. Nice job! It looks like you couldn't have asked for better weather. 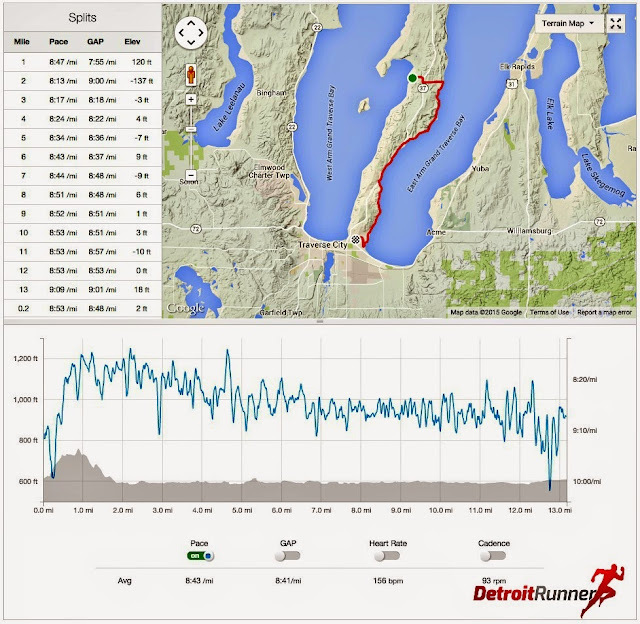 It really is a great race, and you mentioned all of the things that were highlights the year I ran - beautiful scenery, a Brooks shirt, being pleasantly distracted by runners going the opposite direction, great post-race environment, etc. If you go back again, do you think you'd pick the half or full? I've only done the half and wasn't thrilled with sitting in the field for over an hour, then I got stuck in a porta potty line that took over half an hour and caused me to start way farther back than I should have. I think I'd have to debate running the full instead next time. It sounds like you enjoyed both, so I just wondered if you had a preference. It's always nice to read about your races, but... it looked like an 'easy' half with perfect running weather, so my question to you is: Why didn't you push it a little harder? if you want that BQ of 3h25 you have to start running easy halfs at marathon pace. Do you race again before your marathon, and have you any goals for your marathon? I did the 10K last year and loved everything about this race!! Your reviews are awesome!! !